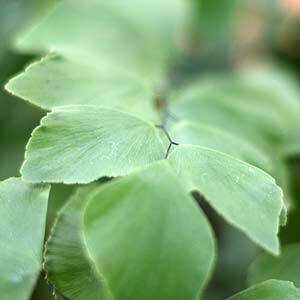 With delicate ferny foliage, Maidenhair ferns are a large group of ferns (Adiantum) with over 150 species. They are a popular fern for growing indoors although with proper care and in the right conditions many varieties can be grown outdoors as well. Although originally from tropical and temperate climates, the secret to growing Maidenhair Ferns are constant conditions, and a little humidity. Adiantum gracillimum (picture right) is a shade loving delicate fine leafed maidenhair fern that is widely grown in pots as an indoor plant, it can also be grown successfully outdoors in a shaded moist position. Filtered light is best for this one, not direct sun. If you can find a warm moist position it will thrive. Adiantum aethiopicum is the common maidenhair, easier to grow than most in an outdoor situation. A. raddianum fragrantissimum (fragrans) is a sub species, and probably the most commonly grown indoors. A. fulvum is the ‘New Zealand Maidenhair’ a more erect species with foliage not as fine as others. 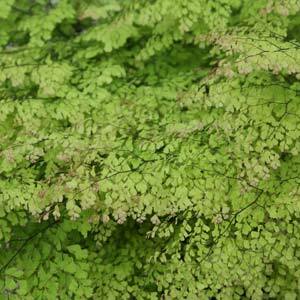 Look for Adiantum raddianum variegatum with its attractive variegated foliage. Maidenhair Ferns grow well is a moist shady position and do well in containers indoors. A well lit area but with indirect light is best. Maidenhair Ferns will grow to 1m depending on species and conditions. They do not like cold and although they like moisture do not like soggy conditions. Many home gardeners find the bathroom a good position for maidenhair ferns, they do enjoy the humidity, try to water with tepid water rather than cold water straight from the tap. If the maidenhair ferns does dry out soak the whole pot in tepid water. Propagation is easiest by division but also possible from spores. We use a liquid seaweed based fertilizer with all Maidenhair ferns, the occasional application of some worm castings or liquid worm waste, seems to work well. A saucer of water placed beneath the pot will provide the humidity that these ferns like, but remember to sit the pot above the water on some stones or ‘pot feet’. If allowed to dry out your fern may appear dead, try a good soaking (overnight) in a weak liquid fertilizer solution and you may be surprised as it comes back to life. Aphids can be controlled with a pyrethrum spray. These plants do like moisture, however not wet soggy soils. Over time, Maidehair Ferns grown in pots will need to be repotted as the potting mix breaks down. Generally every 2 years, sometimes every year. In low light, plants will use less moisture, so again do not over water. To much fertiliser can burn the roots of potted plants. Lack of humidity These are a fern that like a humid situation, mist spray, or grow them in the bathroom. You can also place the container on a tray or saucer pebbles with water in it. The pot/containers sits above the water, so the roots do not get to wet, the water in the saucer increases humidity. Generally caused by lack of humidity or under watering. Maidenhair ferns like warmth, not heat and not cold.